If you're looking for a premium Android tablet that won't break the bank, this early Black Friday 2018 deal for the Huawei MediaPad M5 8.4 will be a great fit. You get top-end design, plenty of power under the hood in the form of a Kirin 960 chipset and 4GB of RAM, 32GB of storage, microSD slot, a QHD 8.4-inch display and Android 8 Oreo on screen. All in all, the Huawei MediaPad M5 8.4 is a great alternative to the older, and pricier, iPad Mini 4, offering great portability at a great price. 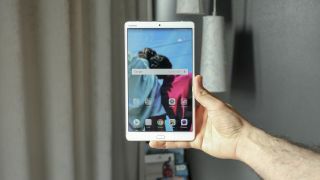 If the 8.4-inch display isn't big enough for your needs - perhaps you're a Netflix binger or avid PUBG gamer where every extra inch of screen helps - then the larger Huawei MediaPad M5 10 is also on sale this Black Friday at Amazon. It has the same premium design and powerful innards as the M5 8.4 above, with the MediaPad M5 10 just increasing the size of the screen to 10.8 inches and the battery to 7,500mAh. There's plenty of time to pick these tablet deals up, as the prices will remain this low all the way to November 28 (as long as stock lasts).